If you are currently completed your A Level, BTEC or Access course and you are considering studying Education at university then we would love to see you at our Education Taster Day. 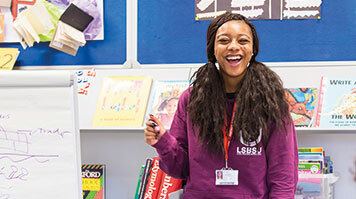 The School of Law and Social Sciences at LSBU is the home to four divisions which cover courses from Education, Law, Social Sciences and Urban, Environment and Leisure Studies. This taster day will give you the opportunity to find out what life is like as an undergraduate student at LSBU, meet our current students and spend time with academic staff who will be able to tell you much more about what an education degree entails. As well as a complimentary lunch and information about education studies, you will also attend a workshop on Community, Family and Children and hear from our Student Ambassadors. Download the Taster Day programme (PDF File 90 KB). Booking is essential so please register today to confirm your attendance.